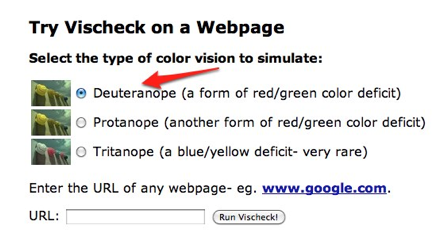 Select the type of color blindness you want to simulate at the top of the page. 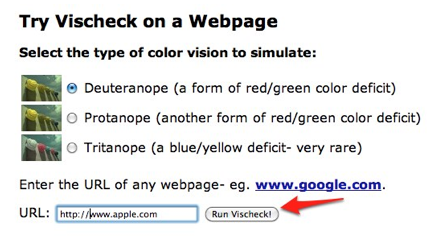 Enter the web address of the web page you want to check and select Run Vischeck! On the results page, click on the link for the simulation you selected. 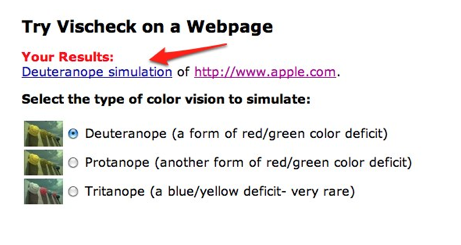 This will show you the web page as it would appear to a person with the type of color blindness you selected. Enter the web address of a website you want to check in the Type a URL text box. Select the type of color blindness you want to simulate from the pull down menu. After a few seconds, you should see the website open with the colors as they would appear to someone who has the type of color blindness you selected.